‘In 1996, my wife and I purchased a dilapidated log cabin on Lake Nancy in NW Wisconsin. In 1997, Peter Edmunds, (Matt’s father) and his crew, spent weeks doing a complete restoration to that cabin, much to our complete satisfaction. 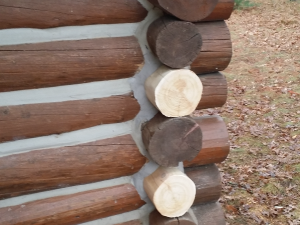 Rotted logs were replaced, new logs added, structural improvements, and chinking was done. We were very pleased with the results. Fast forward almost 20 years… Weather and time caused some minor issues with the exterior of our cabin and we found out that Matt Edmunds had continued in his dad’s footsteps. 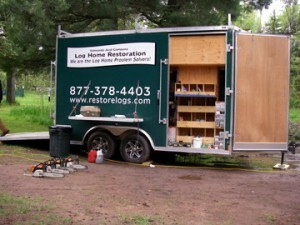 Edmunds and Company was still restoring logs homes. As per our request, Matt came out to our cabin, surveyed the areas of concern and gave us an estimate on the repairs needed. ‘Just wanted to drop by & tell all of you – thank you so much for everything you did. In addition to what I wrote the first day, I need to add that Jesse & the whole crew were professional, skilled, meticulous, conscientious, respectful, personable & as we travelled through our house adventure – they all felt like they were our friends. Will we forget any of you – Jesse, Barb, Jed, Ryan, Ira, Dan & Jafra? NO. Matt you have FANTASTIC PEOPLE!!!! Would I recommend you? Definitely!! We’ve already been singing your accolades to all who will listen. One of our best days was when Tom located Matt Edmunds & Company and there is NO BETTER CREW than JESSE’s!! Your company always had our wishes in mind – we are impressed. All through the process, everyone has been willing to answer any/all questions (even at the end of the hottest & most humid days when they were involved with cleanup.) Thanks for loaning them to us for our house restoration. When I returned last night at 7PM before I even went inside, I walked all around the house admiring the final “look”. I chose Edmunds and company because they came very highly recommended, but still, I always have a bit of trepidation when someone new shows up. Sometimes, it’s the little things that make the difference. This was the scene that eased my mind. 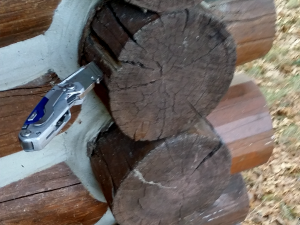 Although it was a bit unnerving seeing four chain saws aimed at my beloved log cabin, I was so impressed that the crew lined them up so neatly. Since they automatically put that much care and artistry into that task, I knew my house was safe in their hands. When someone stops by, we stand in the driveway and I ask, ‘Can you tell which logs were repaired or replaced?’ The person looks at the wall, looks at me, looks back at the wall, stares, and says, ‘No.’ And I have a hard time not jumping up and down as I say, ‘Isn’t that awesome? They did nine logs! Skilled, efficient, punctual, courteous, tidy, helpful – I am extremely pleased. Thank you all. The work looks good and we liked your crew. They were fun to have around! We’ll miss them! Matt and company: Thank you very much for a real professional job. Your employees have a great work ethic and the house looks great. Blaise and Dave were wonderful at explaining things. We will be in touch if we find anything else in the future. We are very pleased with the work done. They are very nice people, very efficient and professional and they did a great job! Very happy with the job and the crew was great. Thanks for a really beautiful and fast job replacing our post and crown end. As always, we are extremely pleased with your work. Jed and Blaise were wonderful and very accommodating. Thank you so much for all the hard work you and your crew performed on our home. Jesse, Blaise, Jed, Chris, Mike and Barb were all really wonderful to have around. They are a terrific bunch! Thank you Edmunds and Company team! My little cabin looks AWESOME. I am so happy with the work everyone did during those hot, hot days. Thanks for everything – truly a professional business. Excellent customer service. You have a great crew. They do excellent work and are enjoyable to work with. Thank you. Thank you for the fantastic workmanship on my cabin. You are true craftsmen. We are grateful that the heart of our family is saved. Thank you again for your amazing craftsmanship, attention to detail and beautiful results. We realized we were in great hands from our first meeting with Matt Edmunds prior to purchasing our 100+ year old log lodge in Northwest Wisconsin. Matt’s expertise was apparent as he surveyed the building and gave us a realistic estimate on the extent of the structural restoration that would be required and the necessary time frame to complete the job. At the start of the next summer, Matt and his highly talented team, led by Jesse, began the extensive repair to over 25% of the building. Most of the problems in the structure arose from years of water damage, which had never been addressed properly. The Edmunds crew approached these problem areas from engineering, architectural and aesthetic perspectives and replaced whole sections of the original building, while staying true to the original historic character. For over five months, the talented men and women of the Edmunds crew came to the project every day with amazing energy, enthusiasm and skill. They made even the most difficult obstacle seem like just another interesting challenge. The restoration is now complete, and we cannot believe the transformation. In addition to extensive log replacement and repair, the Edmunds team also sand blasted and stained all of the exterior logs and applied fresh chinking. Our historic log lodge, which had previously been dull and weathered, is now restored to its original splendor. We are thrilled with Matt and his team and give them our highest endorsement. Join the ranks of our happy customers… Call us today with your log home problem at 715-373-5744 or contact us.